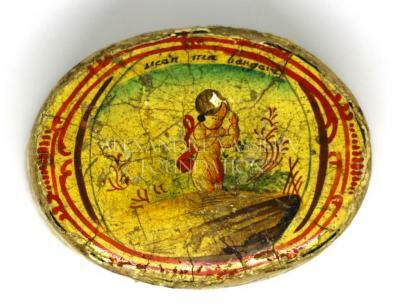 Painted and varnished box, known as 'bergamote'. These boxes were intended to contain treats, pastilles and other sweets, but also snuff or, for the larger ones, other items like handkerchiefs and ribbons. They were often painted with landscapes, genre scenes or musical instruments, animals, religious subjects with portraits of Saints or cruder examples with caricatures of kings or queens. They often had writing on them, sometimes in Latin, which expressed affectionate messages, of gallant and precious love, or words about the passing of time.